TF Club posted on their Weibo page a picture of an individual carded Deluxe Combiner Wars Groove! So if you didn't get the Unite Warriors Defensor, looks like you'll still have a chance to add this toy to your Hasbro Protectobots! ...Well, nobody forced me to buy the Unite Warriors Defensor, I suppose. I wonder if I can flip this... no shortage of Hasbro Protectobots out here... meh, probably way too much trouble. But hey, I'm glad people can finally get their Groove on. Now if they'd just go and do this with Blast Off. I'm already partway to putting THAT team together (decided that the colors on the UW Bruticus are really not for me, Onslaught aside), so although the colors look great on the Space Harrier I can probably wait. I guess they heard that there were still some people out there that liked Rook. Edited by Lazy Garou, 23 March 2016 - 11:49 AM. This is likely linked to the Toys R Us Taiwan promotion that they're giving away a free Groove with so much spent on Transformers. So it might not indicate a US release. At least not yet. Location:The planet that is farthest from. That's definitely interesting, and if meant for regular release certainly increases the possibility of a Hasbro Off-Blast or whatever they opt to name him. I never knew Groove was supposed to go with Sky Reign. Edited by Gearshift, 23 March 2016 - 11:59 AM. Aw yeah, a fifth member of Sky Reign! I think you're right Randy. We just updated the front page with this story stating this exact thing. Eh, I bought the UW set for grey Streetwise as much as I bought it for deluxe Groove, so I'm still happy with my decision. Like Randy said, this could just be for the limited Taiwan release, but it'd be great if it ended up released in the US in some capacity. It at least gives me hope this mold would make it into a G2 Defensor set if one ever gets made. Also, possible argument against this being Taiwan only: the packaging is multilingual. Why would it be multilingual if only one of the languages on the box is likely to be known in Taiwan? I imagine this is likely leading up to an online only release like they did with Slingshot and Wildrider. The Taiwan promotion is just first. Blast Off is due out in June from Takara, so I'd be surprised if he was included with this. Well, it's the Americas-flavoured multilingual packaging, which is what Asia normally gets, so you could argue that they're just matching what's normally released there. But realistically, I think it's super-likely this'll get a similar kind of release to Quickslinger and Brake-Neck. Thanks Gizmo, saved me the trouble of updating it. 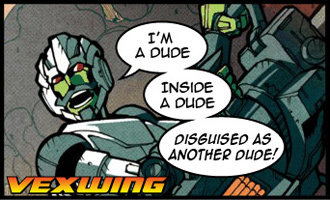 EDIT: Also, it has Combiner Wars Groove art. I would be pretty surprised if Hasbro Asia commissioned entirely new art for Groove to entirely package a short run of a giveaway item. Really, the existence of unique packaging at all leads me to believe this is a retail toy. Now, it may not end up as a US retail toy, but I'd say it seems a lot more likely than not. In other words, to paraphrase a certain sentiment from around here: to people who still think Groove will be Takara-only. He was never TakaraTomy only. Yay, Deluxe Groove is finally happening for u--? Well, i hope we do get a release at some point. Whilr i like my Defensor with Rook and Groove Armour, i will definitely take a bigger Grove to use on either Op Max or Sky Reign.